Warwickshire have chosen Neil Snowball as their new chief executive to succeed Colin Povey when he leaves in December. Snowball, 49, who had success leading the organisation of the recent Rugby World Cup, was also head of sport operations at the 2012 London Olympics. The Guildford-based lifelong cricket fan has also served on the Championship committee for Surrey. He will relocate to the West Midlands next month to replace Povey, 54, who announced his retirement in July. 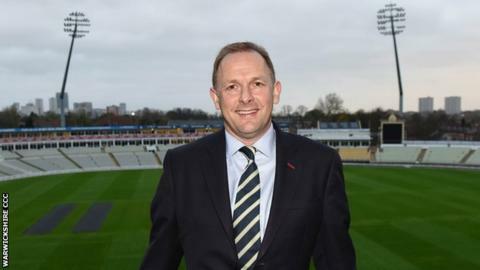 "I am delighted to have been appointed as Warwickshire's chief executive, joining a club with not only a proud and successful history but with a clear ambition for the future," said Snowball. "The strength of the playing squad, as evidenced by performances over the last five years, and the world class facilities at Edgbaston offer enormous opportunity." Warwickshire chairman Norman Gascoigne said: "Neil was the outstanding candidate for the role. "He will bring a wealth of relevant experience as the club strives for greater success on and off the field, building on the outstanding platform created under the leadership of Colin Povey." Povey has been in charge for almost 10 years, having taken over from former Warwickshire and England opening batsman Dennis Amiss in January 2006. His time at the helm has included the £32m redevelopment of the county ground to help restore international cricket to Edgbaston, as well as striking the lucrative deal with the local council to rebrand the county in Twenty20 cricket as the Birmingham Bears in 2013.